HIGH PERFORMANCE SYNTHETIC 20w-50 MOTORCYCLE ENGINE OIL: API Service SJ, SH, SG, SF, CH-4, CG-4, CF-2, CF, CD. HIGH PERFORMANCE SYNTHETIC 20W-50 MOTORCYCLE ENGINE OIL: API Service SJ, SH, SG, SF, CH-4, CG-4, CF-2, CF, CD, JASO MA. AMSOIL Synthetic High Performance 20W-50 Motorcycle Engine Oil is specially formulated to provide tough lubricating protection in the most demanding operations. It is recommended for use in all four-cycle motorcycle and ATV engines, including those with wet clutch systems requiring API CD, SG-CG or SH-CD oils. 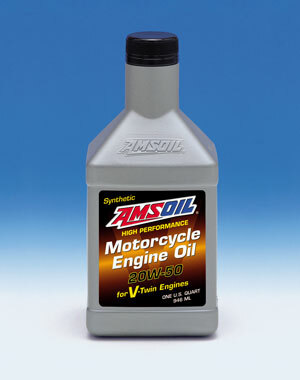 AMSOIL Synthetic Motorcycle Oils are specially formulated with high levels of zinc and phosphorous for superior protection of cam lobes and other high pressure components. In act, AMSOIL Synthetic Motorcycle Oils contain more zinc and phosphorous than other popular motorcycle oils (see graph). 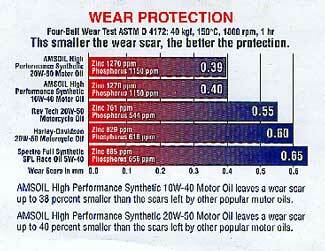 AMSOIL Synthetic Motorcycle Oils leave a wear scar up to 40 percent smaller than the scars left by other popular brands in the ATM D4172 Four-Ball Wear Test. Some motorcycle and ATV transmissions and engines share an oil sump, so the engine oil also provides wear protection to the transmission gears. AMSOIL offers superior wear protection to transmission gears, which are often subject to high surface pressure and rotation speed. It also promotes proper wet clutch performance. AMSOIL Synthetic Motorcycle Oils contain no friction modifiers, making them ideal for motorcycle and ATV engines. The friction modifier free formulation of AMSOIL ensures dependable starting, smooth running, good fuel efficiency, desirable stall speeds and clutch compatibility. AMSOIL Synthetic Motorcycle Oils contain a robust dispersant/detergent package, making them ideal for use in high-stress motorcycle engines. The dispersant/detergent additive packages allow them to stay serviceable longer than other oils. AMSOIL High Performance Synthetic Motorcycle Oils provide superior performance. Their outstanding low temperature fluidity ensures easy cranking, dependable starting and fast post-startup protection. The superior high-temperature protection ensures the formation of a clean, protective film of oil between working parts during high-temperature, high-stress operations. High-temperature operations often lead to the thermal degradation and oxidaion of conventional oils, which leads to the formation of deposits, sludge and varnish. AMSOIL withstands thermal degradation and oxidation at higher temperatures than conventional oils do, ensuring clean, dependable performance in high-stress, high-temperature operations. Especially in air-cooled engines. In general, Japanese motorcycles use 10W-40 (AMF) while US and European motorcycles use 20W-50 (AMV). Check your owner's manual. AMSOIL High Performance Synthetic Motorcycle Oils will not void new motorcycle warranties. New motorcycle warranties are based on the use of oils meeting specific API service classifications and SAE viscosity grades. AMSOIL meets the current API and SAE requirements (as labeled) and is perfectly suited for use in any new motorcycle stipulating those requirements. 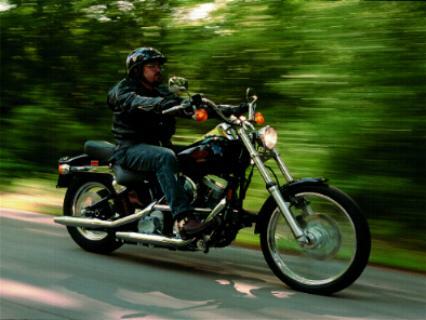 AMSOIL High Performance Synthetic Motorcycle Oils (AMF and AMV) are formulated for extended drain intervals. Change AMF and AMV at three times the engines manufacturer's recommended drain interval or one year, whichever comes first. If a vehicle is equipped with an AMSOIL Oil Filter, the filter should be changed at 12,500-mile or six-month intervals. (whichever comes first) in gasoline engines. Non-AMSOIL oil filters should be changed at the engine manufacturer's recommended filter change interval. Change AMF and AMV at intervals specified by used oil analysis. AMSOIL High Performance Synthetic Motorcycle Oils are also ideal for marine engines and all terrain vehicles (ATVs). Change AMV at three times the engine manufacturer's recommended drain interval or one year, whichever comes first. Change AMF at three times the engine manufacturer's recommended drain interval or six months, whichever comes first. AMSOIL INC. warrants that the use of its lubricants will not cause mechanical damage to any mechanically sound equipment when AMSOIL INC. products are used in full compliance with AMSOIL recommendations.